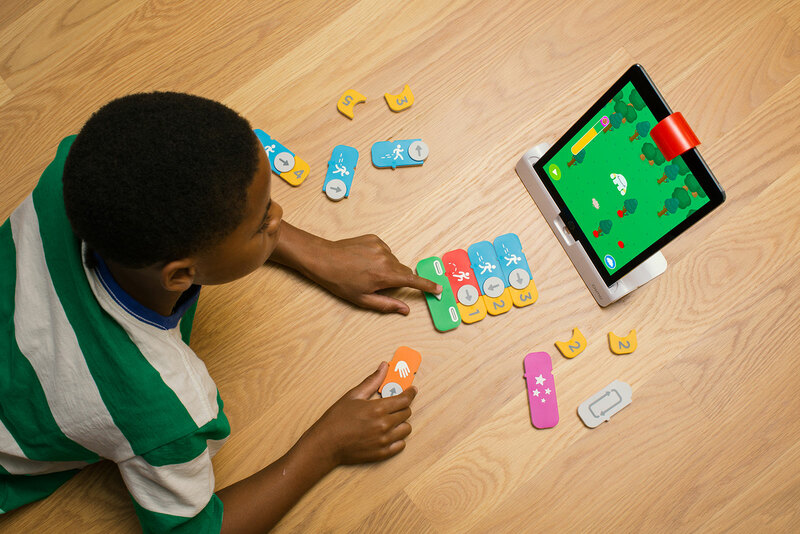 The iPad game and magnetic pieces are designed to teach kids how to program. There's a growing sense among educators and parents that learning to code is a valuable life skill. The UK has implemented programming in its computing curriculum, and several companies have cropped up with toys and games designed to teach young 'uns how to code. Today a startup called Osmo has come up with its own solution: an iPad game that teaches kids to code with physical blocks. Think of it as Lego for coding. It's simply called Osmo Coding, and it builds on top of the Reflective AI platform the company launched a couple years ago. You essentially fit a mirror over the front-facing camera of an iPad, and through some clever software and visual-recognition tech, it's able to translate any physical objects in front of the iPad to a digital environment. Previous Osmo titles include Words, which uses letter pieces, and Tangram, which uses geometric objects. Osmo Coding functions in much the same way, except that you use physical blocks to direct the actions of a character in a game. The character is called Awbie, and it loves strawberries. Indeed, the objective is to make it eat them while maneuvering through obstacles like trees, bushes and lakes. Each of the aforementioned blocks represents a certain command like going up or down or an action like "jump" or "grab." You can also group the blocks together to form a series of commands, which is handy if you want Awbie to get to its destination faster or eat a whole bunch of berries in a row. There are also modifier blocks like "loop" and "if-then" Boolean-style commands for those who are more advanced. I had a chance to try out Osmo Coding for a few minutes and found it a lot of fun, even if I am way outside the target age demographic. Putting the blocks together was pretty intuitive since they're all magnetic, and they click together in a satisfying way too. It also doesn't hurt that they look and feel great in the hand, with smooth edges and bright colors. Even without the game, I had a fun time connecting the pieces together. Of course, it only makes sense when you pair the blocks with the game. As an adult, I picked it up pretty quickly. I learned that you could put number modifiers next to certain code blocks so that Awbie would do the action more than once (like going right three times and then down twice). The game world is purposefully open-ended; there's no one way to get to your objective. You can have Awbie eat all the strawberries with simple actions, but it'll probably be a lot faster if you go with more-complicated commands. The game also provides better rewards if you're smart enough to create more-sophisticated sequences. Interestingly, there are also certain blocks that won't click together no matter what, simply because it wouldn't make sense. Osmo CEO and co-founder Pramod Sharma says these are built-in constraints to guide you to make the right commands. But aside from that, the game is actually pretty forgiving if you make mistakes -- say, if you accidentally guide Awbie into the water or have it bump against a tree. "Just like Lego, it's OK to make mistakes," says Sharma. 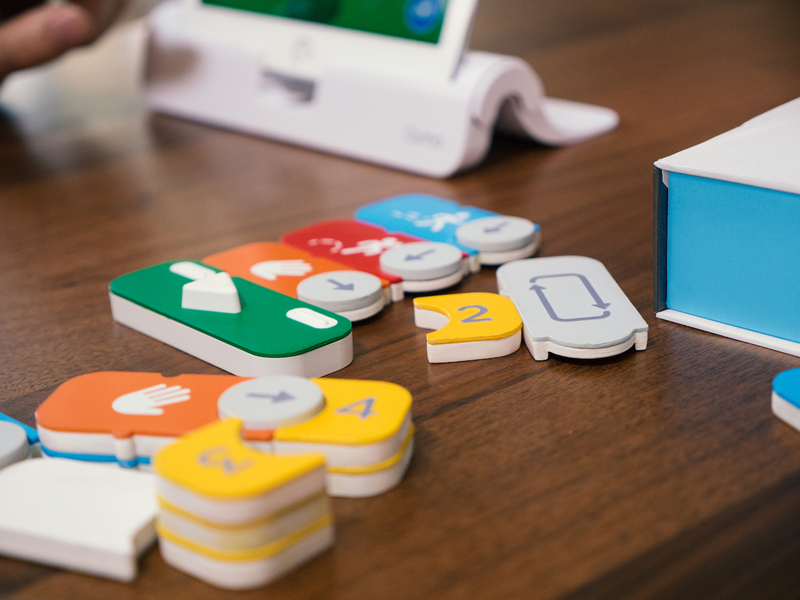 The idea behind Osmo Coding was actually the brainchild of Ariel Zekelman, a hardware engineer from Northwestern University. As a 23-year-old, she'll apparently be the youngest person to have designed a product that will be sold in Apple stores. "When I was young, I was always playing with my brother's Legos," she says. "My mom bought me dolls! I didn't have Legos. But I always wanted to build stuff." In college she found herself in an Art and Science class where she and fellow collaborator Felix Hu worked on building tangible experiences for kids. "Children are on their iPads, but they're not building and touching anymore," she says. "Instead of building with Legos, they're touching their screens." 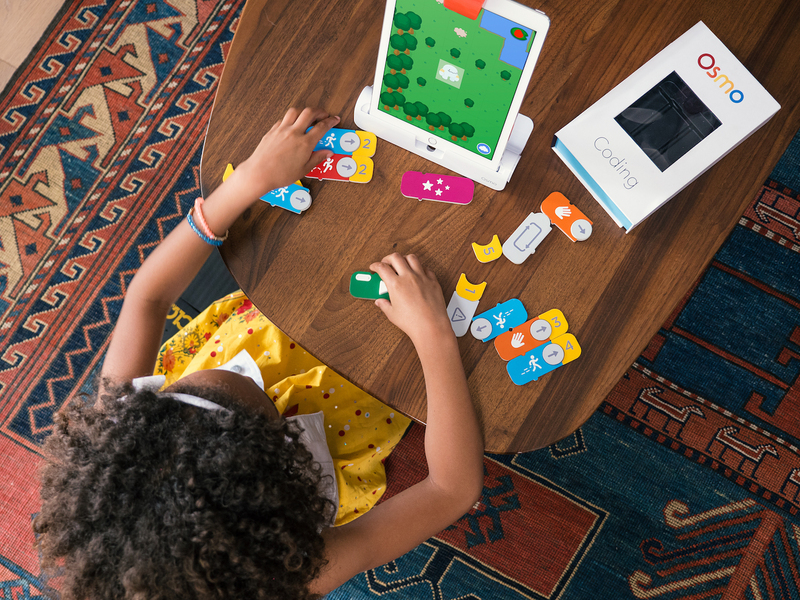 When Osmo started to create the idea of making a coding game accessible to kids, it was pretty tough. "Coding is a very abstract concept," she says. "Bringing something that's literally rooted in abstraction and the digital world into the physical space is very difficult." But through trial and error, the company came up with Strawbies, which is what the game was initially called. "Putting these two things together [the blocks and the game] is genius," says Sharma. "It's taking those abstract commands and manifesting it." Sharma, a former engineer at Google, especially appreciated how the game was able to transform the act of programming and boil it down to fundamentals. "These concepts are very simple to grasp. But you can build very complex things with them." Osmo definitely had Lego in mind when it came up with the idea for the final product. "There are three principles we learned from Lego," says Sharma. "First, it's open-ended. Second, it encourages experimentation. And third, it's a hands-on, physical thing." Combine all three factors, he says, and you end up with a product that'll help kids learn and remember better. "Our goal is to be the first true introduction of programming to kids," she says. The stand-alone Osmo Coding base will be available from Amazon, Apple and PlayOsmo.com starting today for $49, but that's assuming you already have the Osmo base (the iPad stand and mirror). If you don't, you can get the Coding Kit, which has both the base and the Coding blocks, for $75.